PROMINENT horseman Michael Stanley is in a strong position to register a two-state feature double on Saturday night. Although based in Victoria, Stanley’s bid for Group glory will see him have runners engaged in South Australia and New South Wales. Obviously unable to attend both meetings, Stanley has elected to make the road trip to Globe Derby, with his father, Ian, taking care of the Tabcorp Park Menangle representation. “It was a tough choice but at the end of the day I’ve got guys like Luke and Todd McCarthy who can drive for us in Sydney so I’ll float to Adelaide,” Stanley said. With two starters in the South Australian Derby, Stanley will partner Watch List from the pole. Luckless during the recent Victoria Derby heats, Watch List is among the leading prospects in the Blue Riband. The son of Betterthancheddar will also boast plenty of star power in his cheer squad, with his part-owners including Adelaide Crows players Brad and Matt Crouch, Josh Jenkins and ‘Tex’ Walker set to attend the meeting. As impressive as those names may be to some, particularly locals, the real ‘boss’ of the ownership group is Stanley’s wife, Gen! “He was set for this race as a few of the Adelaide boys own him and they’d love to see him win at Globe Derby,” Stanley said. “It’s a really good draw for him and hopefully he can make the most of it. Stanley’s second runner – A Fair Ol Dance – has drawn to trail his stablemate from the inside of the second row. “He is a really nice horse and I was happy with Victoria Derby run,” Stanley said. “He is quite strong instead of fast, so I’m not sure the trail run will suit him. Stanley will then contest the South Australia Cup with Konan, which is poised to make his stable debut. The son of Mach Three is on the second line of betting from barrier two at $3.70 with TAB Fixed Odds, with Sicario the $2.60 favourite from the pole. “I got a call out of the blue asking if I would train him and you always welcome a quality horse like that,” Stanley said. Towards the east coast, Stanley has Soho Burning Love ready to contest the opening race on the program. Although the daughter of Auckland Reactor has drawn gate 10 Stanley remains confident the mare can make her presence felt. Rounding out Stanley’s hopefuls is Rackemp Tigerpie, which is making a second attempt at qualifying for next week’s Chariots Of Fire. Unplaced in the Hondo Grattan Stake last weekend, the son of Rock N Roll Heaven has drawn the pole in the Paleface Adios Stake. 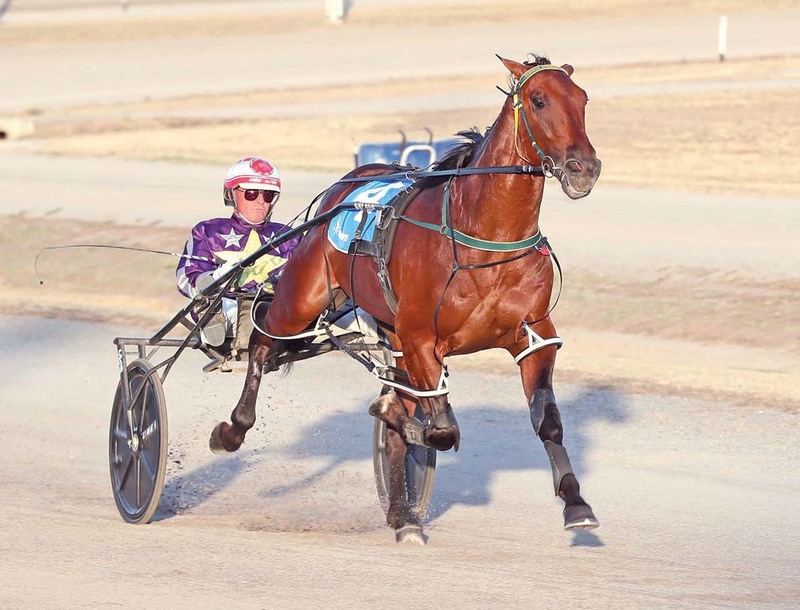 “A lot of people will be disappointing in him last week, but he was a bit green at the start with it being his first time around Menangle,” Stanley said. “Not to forget he was left in ‘death’ in a really quick time and any horse which sits outside the leader in that time is going to get weary by the end. Rackemp Tigerpie is on the third line of betting at $6 with TAB Fixed Odds, with Chase Auckland the $2 favourite from barrier two followed by Ignatius on $3 from gate 10.